With digital payment ecosystem becoming advanced, from shopping to banking everything has become virtual. Today we live in a world where it is impossible to live without internet. Since most of our daily activities are based on our smartphones, there is no need to explain the importance of digital payments. From making payments to sending money to friends and families, there is a lot that you can do with mobile payments. Since this payment platform had evolved a lot in the last couple of years, there are a lot of companies who are competing against each other to bring better services to their customers. I have personally tried many of their services and came up with a bunch of apps that shine best in this field. So in this article, I am bringing you those best mobile banking Apps in India that will deliver the best online banking experience that you will ever need. First, in this list, let's talk about Google's own mobile payment service app called 'Tez'. 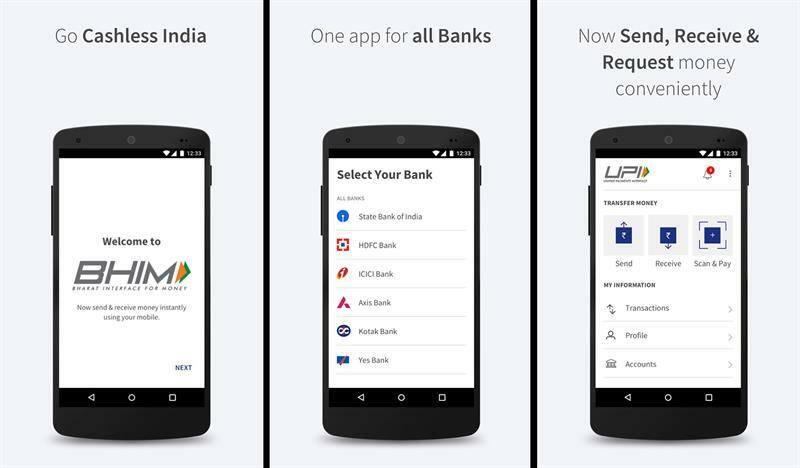 This app from Google which was released back in September 2017, was targeted at Indian customers by linking your bank account with the help of UPI. Tez delivers you almost all the e-wallet features that you'll ever need. With Tez, you can pay friends and families across India directly from your bank. 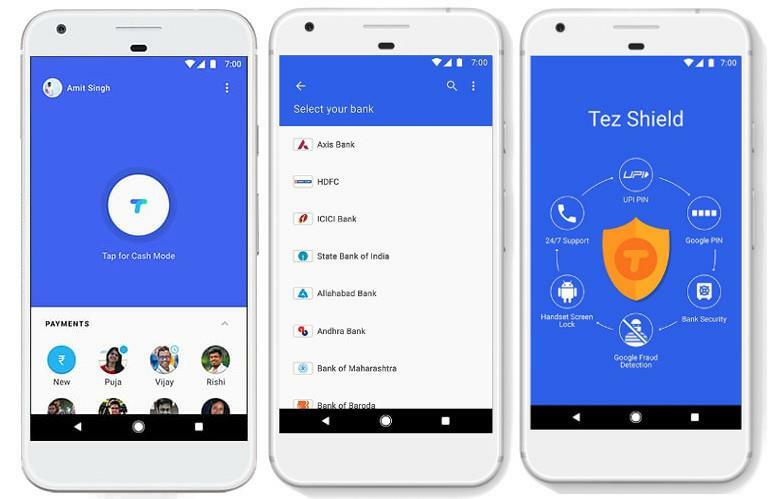 From splitting your bill to online payment, Google Tez is perfect in making money transactions easy. With 24x7 protection shield from Tez, you don't need to worry about your security ever. Apart from that, Tez also allows its users to discover great offers while you do your regular transactions. Another mentionable feature about Tez is the timely reminder which you can set for your monthly bill payments. By turning this feature ON, you never have to worry about your bill becoming overdue. If you always struggle a lot in reloading your wallets every once in a while just like your mobile phone, worry no more, as Tez works with your existing bank account it won't ask you to reload your Tez balance since there is no wallet here to maintain balance in. Paytm has been on the scene of the wallet industry as one of the first beginners. They started out first with aggression and have maintained that aggression even after so many years. With cashbacks and over the top advertising they have been able to become the selected method of digital payments at even the local Kirana stores. They started out with mobile wallets but with the introduction of UPI, they were quick to jump the bandwagon and introduce UPI based payments on their app too. A choice of a majority of Indians Paytm is a no-brainer as one of your preferred wallet or UPI app. One of the finest mobile banking apps is the PhonePe. Apart from delivering all the above-mentioned features, PhonePe also lets users transact up to one lakh rupees in a single transaction. 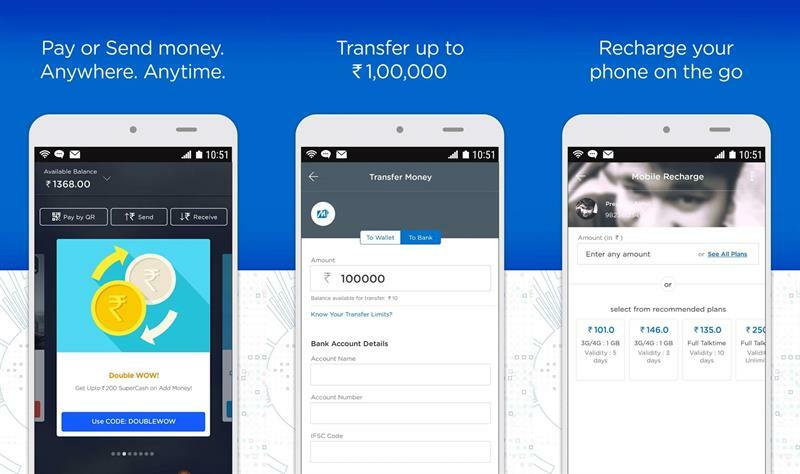 If you are someone who is looking for a UPI app to transact that much amount of money with the ease, then this is the app you might definitely want to try. 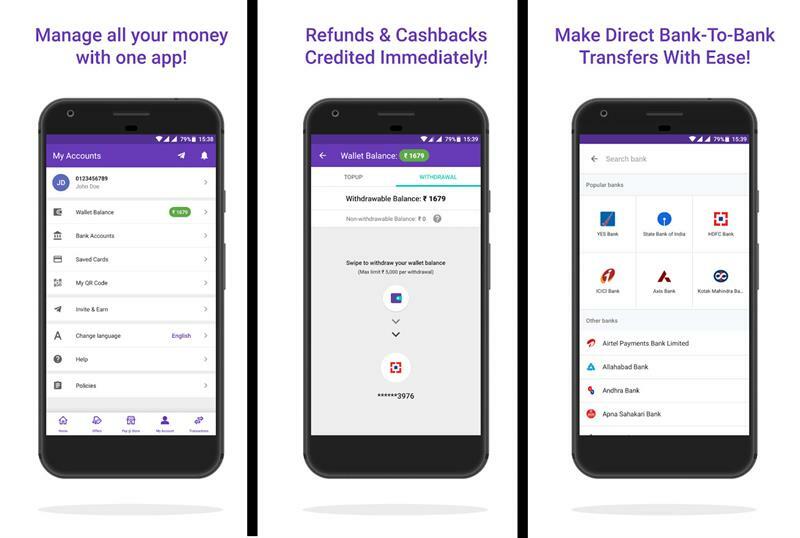 Apart from all these, you are also eligible to get instant refunds and cashbacks if you happened to purchase or cancel an order from any of the partner merchants of PhonePe. One of the best features that you will definitely use frequently is the ability to transfer money within your own bank accounts quickly. KhaaliJeb is a new entrant in the UPI bandwagon, and it looks flawlessly systematic with a refreshing UI. This app is designed to cater students' with benefits by providing them with deals and offers from brands. They also aspire to create an exciting platform for interaction between students and brands. They have also integrated UPI functionalities to the app and their UPI feature could be used by anyone, and not just students, who wish to have the cleanest UI. KhaaliJeb provides the facility to seamlessly transfer the money through UPI Ids, and account number & IFSC, and you can also pay merchants through a QR code. Their Student Loyalty Program is in the pipeline and it could be a 'game changer' offering from them. With MobiKwik you can do various activities like making fast online recharges, bill payments, online shopping, Bus and train bookings etc. With SuperCash & various other offers, you can earn huge amount as cash back and savings every time you do the transaction. With MobiKwik in your smartphone, you need not worry about your losing money ever again. BHIM or Bharath Interface for Money is developed as part of the Digital India initiative by the NPCI which stands for National Payment Corporation of India. With BHIM, NPCI is putting forward a solution to make India go true cashless. With BHIM you can access all your bank accounts in one place. For things to work smoothly, you first need to register your account with BHIM and generate a UPI PIN. That's it! You are good to go with your first transaction. So that's it! Above are the 7 best banking apps to enjoy online banking and experience being true cashless in India. Since it is also important to keep your accounts safe from hacking and other sorts of attacks, you should always research more about a specific app without installing them right away. Although you are free to download and check out each of these apps to see how the interface works, I wouldn't recommend using more than two apps for your UPI-based daily transactions. So what are you waiting for? Go and enjoy cashless India and roam around without having to lose your wallet ever again.